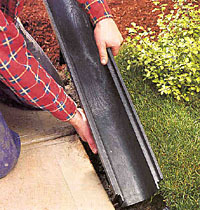 Lightweight, 4" wide, polyethylene channel with matching grate. 1. Prepare a trench and fix a line at the required finished height. 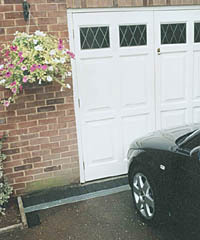 If channel will be exposed to vehicles, embed base and sides in 4” of good quality concrete. 2. Position outlet channel in the trench and ensure that it is level. Connect outlet pipe to the drain. 3. Lay the remaining channels, working away from outlet, and fit end caps. 4. Place grates upside down in channel and backfill with surrounding surface material. 5. Ensure that the finished surface is approximately 1/8” higher than the channel to assist water drainage. Reposition grates correct way up.